The dinner is held to award the Top Promotable Grade Officers, Senior Non-Commissioned Officers, Non-Commissioned Officers, and Airmen of the SHAPE/Chievres Community. 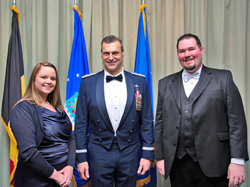 Andrews Federal Credit Union recently sponsored the 2015 US Air Force Awards Dinner at the SHAPE Club, located on S.H.A.P.E., outside of Mons, Belgium. The dinner, an annual event Andrews Federal has sponsored over the past four years, is held to award the top Promotable Grade Officers, Senior Non-Commissioned Officers, Non-Commissioned Officers, and Airmen of the SHAPE/Chievres Community. Major General Joseph T. Gaustella, Jr., Deputy Chief of Staff, Operations and Intelligence, Supreme Headquarters Allied Powers Europe, Casteau, Belgium, the host for the event, spoke on the vital role the US Air Force plays with the United States participation in the NATO Alliance and our partner countries. The award winners will now proceed onto the MAJCOM (USAFE) level to compete against other winners.